YEREVAN (ArmRadio)—Baku is hampering progress in the Nagorno-Karabakh peace process by refusing to negotiate with the authorities in Stepanakert, Armenia’s Deputy Foreign Minister, Shavarsh Kocharyan, said Friday. “By refusing to negotiate with Nagorno Karabakh, Azerbaijan hinders the progress in talks, but still it won’t be able to avoid responsibility for the consequences of its aggression,” Kocharyan said, commenting on statements made by Azerbaijani Foreign Minister Elmar Mammadyarov a day earlier. “Mr. Mammadyarov presented to journalists the results he can achieve if he negotiates with himself, and if a peace agreement is designed only by Azerbaijan, and if this country signs it with itself,” Kocharyan added. “Obviously, the recent statement by the foreign minister of Azerbaijan, is another unlucky attempt to justify the aggression against the self-determined Nagorno-Karabakh Republic, in flagrant defiance of the UN charter, in the Azerbaijani Constitution,” he continued. Mammadyarov told reporters Thursday that the status of Nagorno-Karabakh could be decided only after more than a million Azerbaijanis were allowed to settle in Karabakh. He also said the constitution required that any referendum on Karabakh be open to all of Azerbaijan’s voting population. 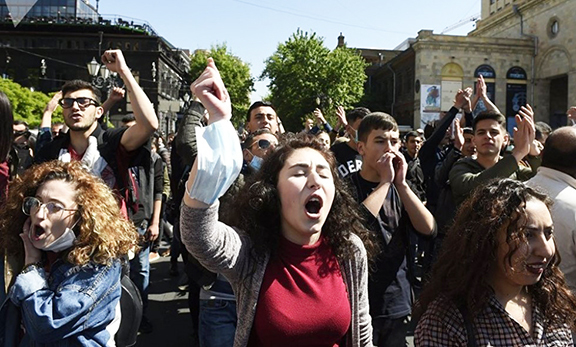 Azeri’s Constitution came to life after the ceasefire was signed. Therefore, Azerbaijan is legally disconnected from Artsakh. Even if Artsakh wants to join Azerbaijan, he has to apply. Also, Kocharian has stated recently, that if Madyarov wants to put his signature on some paper with Armenia, it is O’K. But paper is not going be about Artsakh. Mamedyarov and Aliev think they are still living in Soviet times. Those were the days when they were given the green light by the Alievs of Baku and some Soviet leaders to massacre the Armenians living in poverty on their own land called Artsak. They are yet to clear their minds and souls of the thousands of murders they commited against unarmed Armenian men, women and children living in Sumgait, Baku, Kirovabad and other cities some twenty years ago. NOW I SAY, ‘WHO REMEMBERS ALL THOSE INNOCENT ARMENIANS MASSACRED by the Government in Baku less than 20 Years ago?” Living proof of erdogan’s words a few days ago of deporting thousands of Armenians from Turkey. It is shameful that the so called ‘Civilised’ leaders of the ‘Civilised’ world are mum on the latest comments. History repeats itself once more! LEST WE FORGET & The ‘Civilised’ World.